Bonsai are traditionally shown with the front side of the tree facing the viewer—the back side of the tree is not in view. Most bonsai displays have a backdrop of some kind as well. This allows the tree to stand out and be viewed without any distractions. 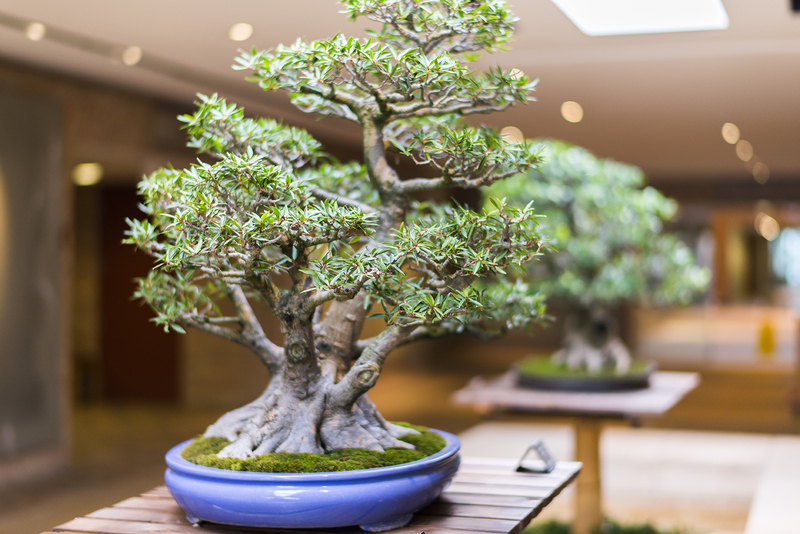 In this unique display—shown for the first time in the Krehbiel Gallery in the Regenstein Center—we give you a look at our bonsai from both the front and back side of the trees. This allows our guests to see the entire tree and appreciate a different perspective. The Krehbiel Gallery exhibition displays trees so they may be viewed from all angles. Choosing a “front” to a tree happens early in its development. A front is chosen in order to present the tree in the way that tells its story best. This can change as the tree matures and changes. The front should highlight the most interesting features of the tree, whether it’s nebari, trunk movement, shari, or jin. 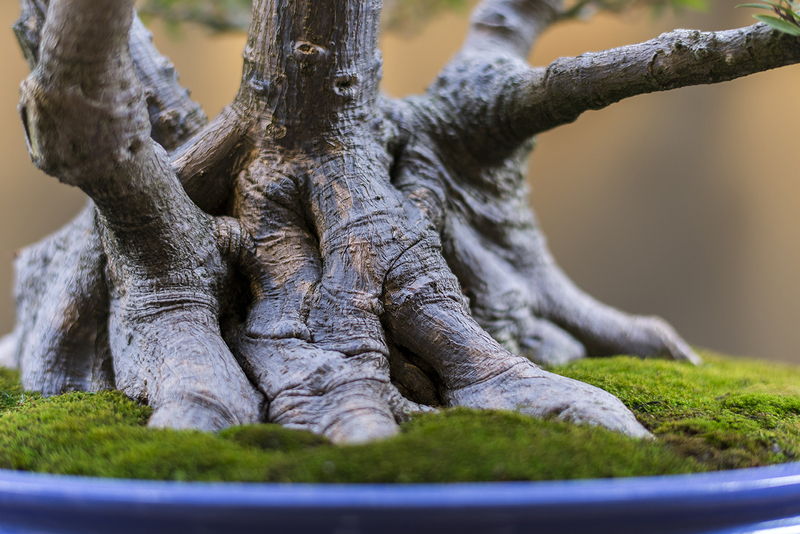 A bonsai’s nebari, or surface roots, form the base of the tree. Often, the nebari (visible root base) of the tree is used to determine the front. This is the oldest part of the tree, and the most difficult to change. Nebari conveys the age and stability of the tree. Trunk movement is another way of choosing a front. From one angle, a trunk may seem rather straight and uninteresting. However, adjusting its position and angle even slightly may bring out the movement that makes a tree special. The red pine below has great trunk movement and sets the “attitude” of the tree. Sometimes a front is chosen for its deadwood features. A striking shari (dead wood on the tree trunk) or jin (dead wood on a branch) can set the tone for the entire tree. The white part on this tree is dead wood, and the reddish brown is called the live vein. The contrast of the dead wood, live vein, and bright green foliage is fantastic. Trunk movement is a highlight of this red pine. This juniper displays amazing shari. Equal care is taken to develop the back of the tree. If the front of the tree is the star of the show, then the back can be considered the supporting cast. The back of the tree provides depth and perspective to the tree. Without these strategically placed back branches, the tree would appear two-dimensional and lack interest. Back branches can also be used to help frame in interesting parts of the tree toward the front, like dead wood branches (jin). When you view this exhibit, look for the indications of the trees’ front and back. The front of a tree will have fewer branches along the trunk line, exposing its trunk’s best features. The back branches cover more of the trunk line, potentially covering features on a tree that are less interesting. Most trees also have a natural lean toward the viewer. Some say the tree is bowing, in order to welcome or greet the viewer. Notice the exposed trunk line in this ficus front. Whether you are viewing the back or front of the tree, you can see the time and care that has gone into its creation. Many of these branching choices were made nearly 100 years ago. Each branch has its place in creating the entire tree. When front, back, and sides come together in harmony to represent nature, it makes the wonderful living art we call bonsai. 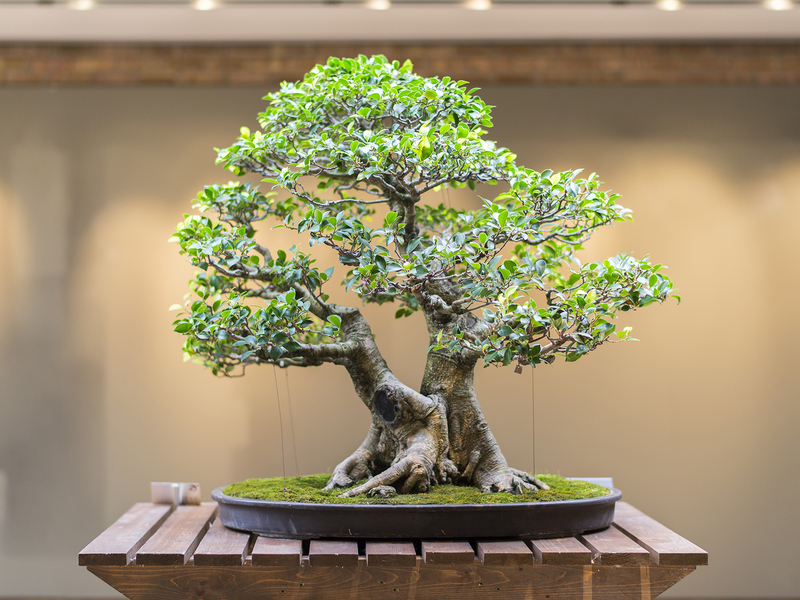 View the Bonsai 360 pop-up exhibition in Krehbiel Gallery through January 24, 2016.